Categories: Instead of TV, Turn-off Week | Tags: Campaign for a Commercial-Free Childhood, CCFC, Screen-Free Week | Permalink. 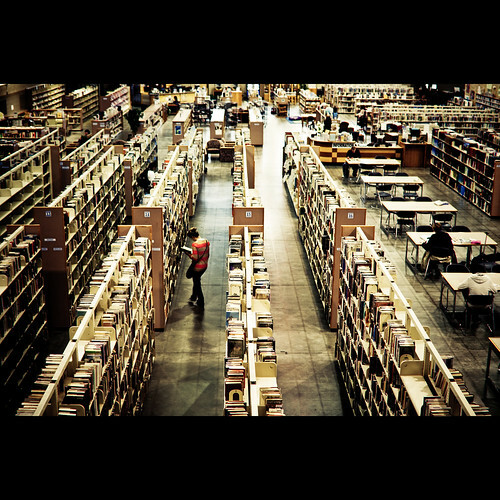 Libraries are not made; they grow., a photo by Eric M Martin on Flickr. Categories: Instead of TV, Reading, Society | Tags: American Library Association, California, Flickr, Jerry Brown, Public library, Reading, reading for fun, reading for pleasure, Subscription library, United States | Permalink. Campaign For A Commercial-Free Childhood now has free organizing kits available for anyone interested in organizing Screen-Free activities (or who are just curious). Click here to go to their download page and the pdf will be emailed to you. Later on, the CCFC will have a list of Screen-Free Week activities around the country, and you will be able to see what is going on in your community. – Inspiring quotes from previous Screen-Free weeks (including an excellent quote from President Obama). – Reproducible Fact sheets to give out when organizing (and during) your Screen-Free Week activities. Includes a FAQ (Frequently Asked Questions) Fact Sheet. Categories: Instead of TV, Turn-off Week | Tags: Campaign for a Commercial-Free Childhood, CCFC, Screen-Free, Screen-Free Week, TV-Free, TV-Turnoff | Permalink. 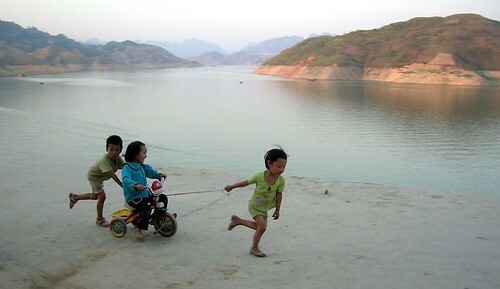 Kids playing, a photo by Philou.cn on Flickr. Barbara Brock surveyed over 500 Low-TV and No-TV families, and further interviewed a number of these families in person. The result is her interesting and excellent book “Living Outside the Box”. Why have these families given up TV ? What do they do with their time? Are they social outcasts? These are some of the questions Barbara Brock seeks to answer. – Resentment and Frustration. Resentment at being raised with too much TV and/or frustration with their own families being too TV oriented. – Technical Difficulties. TVs breaking down, or moving to an area with poor TV reception. And finding the resulting TV-Free existence to be liberating instead of boring. – Outside Prompts. Inspirations such as TV-Turnoff Week, Waldorf Schools, and books about the negative effects of TV. – Raised Without TV. The stereotype is that children raised without TV will become total TV addicts when given the opportunity. As it turns out, growing up without TV was also a major reason for living TV-Free as adults. And what I liked best about this book was that in addition to facts and figures, Outside the Box is also filled with stories from the interviews and feedback. My favorite story was about Jenny, a mom who would labor over a family dinner and then have to tear her kids and husband away from their separate TVs for a family get-together dinner. Finally, out of frustration, she took the garden shears and literally cut the TV cable. Her youngest son started to cry, her two daughters quickly took off to a friend’s TV-filled house, and her husband just stared in amazement. Now, years later, and still TV free, family dinners have become unhurried and filled with conversation, the kids have found lots to do, and even her husband has discovered that “at least now I know as much about my own kids as I used to know about The Simpsons”. Categories: Book Reviews, Instead of TV, Turn-off Week | Tags: Screen-Free, tv turnoff week, TV-Free, TV-Turnoff, Waldorf education, Waldorf Schools | Permalink. Jake Reilly decided to go three months without a Cell Phone, Email, Social Media and TV. He felt that he and his friends were almost always communicating electronically, he wanted to get back to face-to-face friendship. You posted several of the notes you received from friends during your isolation. One note read “Jake, I’m pregnant. Call me.” What was that about? Reilly: Ha! At the school, there’s an elevator. No matter where you’re going, everyone has to use the elevator on the ground floor. So, for the people that I went to school with, that was the first place we’d post projects or memes. I didn’t say this is my message board, but one of the girls just started leaving messages, like, “Hey. I’m on the fourth floor. Come find me,” or “Jake, where are you?” It’s a very public forum, so everybody can read it. It became my message spot. Categories: Instead of TV | Tags: Instead of television, instead of tv, Jake Reilly | Permalink.